According to Coffee Research, average coffee consumption in the states is about 5 kg. per capita or, to put it simply, it’s almost two cups of this strong and smelly drink that an average American would typically drink a day. Even though these numbers seem unremarkable as compared to Finland’s crazy 10 kg. annually or about 1,200 cups per capita, coffee definitely opens a huge window of opportunity here in the US as well as in Canada. So if you’re thinking of how to start a coffee roasting business of your own, you’ve chosen all the right niche. So, it’s open and shut that starting a coffee roasting business promises a lot in terms of income as long as coffee remains a popular beverage among all ages. And fortunately, things would never make a difference, at least for a while now. However, there are too many conditions that might affect how the business is going to get off the ground – well, coffee has never been something simple. So below you’ll find a definitive guide to starting your roasting business in an inexpensive and efficient manner. Familiarize yourself with different sorts – general and specific terms to describe these varieties like AA, SHG, origins and some background history. Learn when the harvest times begin – especially when coffee becomes available for sampling and, what’s more, delivery. Start developing your sense of smell and taste – give up smoking, perfume and other bad habits affecting your senses. It’s absolutely essential to learn how to write coffee descriptors of your own, and without having a perfect sniff there’s nothing you can do about it. Get down to the theory of roasting – you can start reading books and surfing through web resources or going on a course if you don’t have enough self-commitment to tackle the reading task. Get a subscription from a reputable roaster in your area – subscriptions usually come with much detailed information on the coffee you try out. Besides, it’d be a perfect chance to try a wide range of varieties. Apps to help you keep track of your roasts like a pro Roastmaster – quite an advanced app, offers lots of interface features like record roasting, cupping data and analysis. Cropster – one of the most popular apps, ideal for commerce. Roast Buddy – perfect for home roasting, bey would be also a perfect kickstart to novices. Typica – helps plan roasting, calibrate machines and track production and roast. We’d strongly recommend taking a skills course run by SCAA/SCAE and, in addition, attending cupping sessions after you’ve completed some of self-education. There are actually two ways you can build a coffee roasting business: buy beans, roast them and sell them or just take them and proceed them. However, taking into account that any housewife can invest in a professional machine and set in motion, barely could you become the top of your niche just by roasting beans without having access to them. So if you’re really planning to become a successful entrepreneur, you need to learn how to find raw coffee beans of great quality from bean growers. Sad story: probably, after many-hours long trawls around your city, you won’t see any fruitful results since places serving coffee not in a wholesale scale (while you’re a newbie, you don’t need tons of coffee and international suppliers) are most likely to sell roasted varieties. Sweet Maria’s. You’ll be offered more than 100 varieties on their website, so it’s an amazing place to have a smooth entry to the industry and also try as many options for green beans as possible to choose yours. Green Coffee Buying Club. Hand selected beans, responsible suppliers working with both big-time coffee shops and individuals. You’ll be given an accurate flavor profile for any bean you want to buy. Sonofresco. Free shipping all around the globe, best regions from Central America to Africa. This company would suit those who’re after commercial roasting and wholesales. Moreover, you can reach out to local coffee shops and negotiate shipping. Visit Ranker to navigate through shop chains, single storefronts and local cafés. Smart small. Well, 20% off for 30lbs looks like hell of a deal, until it comes clear that you’ve just bought a bag of smoky, filthy Indian beans that are not what you’ve been looking for all this time at all, So, the best recommendation here is to buy as little as 1lb of a few different varieties to see what you like, and only then move on to going big. Stick with the big names first. You want to break into the market and fight off the competition right from the start, but it’s actually not a great idea to experiment with bean types to win your customers. Go with ‘brands’ like Costa Rican Tarrazu, Kenyan Nyeri, Ethiopian Yirgacheffe – there’s always a reason why these coffees are worldwide famous. Learn the nomenclature. Do you know what it means when people say the method was ‘wet process’? Nope? And such kinds of things make huge difference to what happens when you take a sip. So spend some time to sort out processes and methods. Write a plan. Having a detailed and definite business plan is an essential piece to become a roaster. This document describes your financing, productions, services, market analysis, sales strategies and a few other details that are important to success. It could be quite a painful process to come up with a consistent plan, so you’d rather have a guide along while writing like Hal Shelton’s Secrets to Writing A Business Plan. Form a legal entity. When you form an entity, you protect your business from liability. There are different types of structures and classifications, you make sure you understand which income tax return form IRS want you to file. That’swhere you can get started. Open a bank account. Your company is not some homemade establishment – you need a dedicated checking account to make your company appear a way more professional to your clients. Register for your taxes. Before opening the business, you’ll need to register for a number of federal taxes. This amazing article contains all the information on registering for a tax permit in every state. Set up accounting. It’s great to record your expenses and make out what sources of income are most important to grow your business. Once you’ve bought something, whether it’s a bag of green beans or some machinery detail, keep accurate accounts to simplify your tax filling. Obtain insurance. In case you’re planning to hire staff members to help you with your business, consider acquiring an insurance that is actually a legal requirement in many states. The biggest problem on the way to grand opening is that legal requirements very greatly from one municipality to another. Since there’s a plethora of different licenses associated with roastery, you’d better start with basic ones and then battle your path through this heap of documents by research. Good news: if your roaster size is small, you might not be asked for anything more than an application fee, and that’s it. Your space will be thoroughly inspected, though, and if some changes are required, make sure to draw sketches to lay down all the changes and form supporting materials to negotiate with your local municipality. When you operate at some regulated location (actually, any location passing a health inspection will be regulated), you need to require a Certificate of Occupancy (CO). This paper confirms that you’ve met all the local regulations and building codes. Note that’s generally the landlord’s responsibility to acquire a CO. This one is for your beans. If you want to be supplied with quality beans, you’ll need to submit to fair trade audits and pay fair trade premiums. To learn more about this type of certification visit their official website. How to roast and who you plan to work with. This may be very different to every entrepreneur. But of course, nothing could be continued without proper practice and dedication. It’s crucial to master the skill of roasting before getting your doors ready for clients. Tip: practice as much as you can, and engage your family member, friends or random strangers to get honest reviews about the way you roast. Right when you cross the line when 90% of your reviews are positive, then you can go on planning and set a date to open the doors. Don’t forget that during the first operation stage you can hire a professional roaster and learn with pros by your side. When the process of training is done, you feel the power, the next stage is to think of the location where you’d set up your company. You can either set off as a big company or cling to small things, depending on your current budget and overall situation. If you start off small, 550 sq. ft. is more than enough space to install the machine, bagging and stock areas. However, it doesn’t matter what size you’re aiming at, there are three essential aspects you take into consideration. Humidity. Remember that even small amounts of moisture can impact things all the way down to packaging, not to mention it affects the drying phase. You’ll need to put in background heating to manage this problem. Ventilation. Another problem is air quality – roasting causes pollution due to releasing acids and compounds in the process. You need to visit the regulatory authorities who would instruct you on ventilation facilities to put in your place and also give instructions on how to control harmful substances. Storage. Enemies of beans, both roasted and green, are light, too much heat, air and moisture. So to keep them at their peak you need to avoid sunlight, store them in a dark container. Coffee glass canisters are the best solution: put them somewhere in the shade to insure air-tight storage. Besides, once your green beans have arrived, they should be places near your roasting machine to lower the shuffling of coffee bags around your storage place. 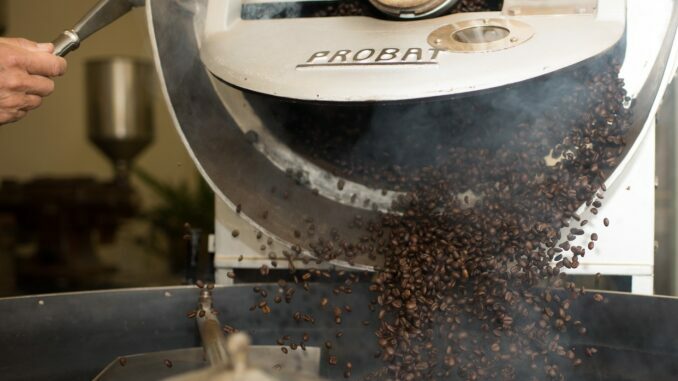 The types of facilities and equipment you’d need depend on whether you opt for both purchasing and roasting coffee or simply roast what coffee houses bring to your place. In any case, this is your fundamental checklist: heat sealers, refrigerator to store some coffee varieties, storage containers of different sorts and sizes, ventilation pipes, measuring scales, and the bread and butter of this all, a roasting machine. Speaking of which, there are there things to consider: size, if it’s easy to clean and price. Size. Commercial machines come in all sizes, so you really need to asses your roasting space to choose the one that’s not going to be a gigantic elephant in the room. Measure the size of your space precisely and then look out for models. Price. Small commercial solutions like KALDI come in at under $1000. High-end machines with 3 kg. capacity might cost around $5000-$10000, and the prices climb up to $50000. Besca USA is one of the best industrial companies manufacturing all types of machines. They offer everything from a 1 kg smallies to incredibly big 240 kg commercial machinery. SFR, Dedrich and Probat are among decent companies, too. Packaging supplies and labels, around a couple of cents per item. Coffee grinders, costing between $400-$2000. Heal sealer, costing from $40 to $400 and even more. Roaster, where price can fly up to sums like one hundred thousand bucks. Green beans that usually cost around $4 a pound, but that’s a price for wholesaling. What’s more, you’ll need Internet access, a computer to accept orders online and vehicles to deliver your production to customers. Once of the most effective marketing strategies for coffee companies is to develop in a two-sided direction: while your local presence is progressing through words-of-mouth, booklet advertising and local promos, you need to lure in online customers and connect with the Internet community to draw more audience to your coffee products. There are so many things to talk about here, but you should start with the following: get your Facebook marketing together and remarketing tools as well, learn what makes up good SEO, build a website and a few social media pages, comment on forums and don’t forget about adding your venue to popular navigation apps and services like Google My Business to draw more customers – here you’ll find a complete guide to adding your company to maps. Providing exclusive certifications like Fair Trade or Organic Certification to highlight professionalism and devotion to the cause. Specializing in complex roasting techniques and offering unusual coffee varieties to attract high-concept cafés and fans of unique production. Building your brand’s voice by providing signature packaging – some no-name grey bags with no labels won’t allow you to nail identity aspects and stand out. But most of all, keep moving on. If you think that you’ve explored all the regions in the world and tries all the sorts, you’re being very delusional about the power of the coffee industry: there’s always room for improvement.